Reverse fold Roman shades hang flat when fully extended - featuring the fabric. They are similar to front fold shades with a difference. Stiffening rods are inserted into narrow channels sewn into the fabric at regular intervals across the back side of the shade. The rods encourage the fabric to fold evenly giving a neatly stacked look when raised with less hand dressing. 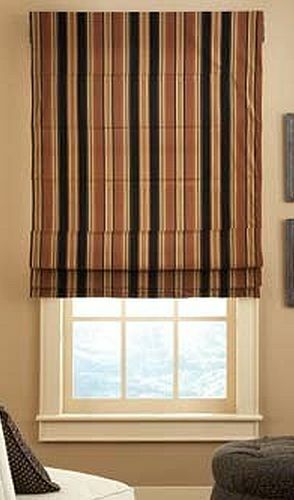 Where front fold shades show the fabric channel, reverse fold shows only the seams. The seams add a horizontal element drawing your eye around the room. They add a soft tailored break in the lay of the fabric. The shades seem to widen the windows. Also known as plain or back slat Roman shades. This style is especially well-suited for vertical stripes and solid fabrics. Regular patterns (such as damasks) will show a pattern break at the seams due to the reverse tuck of an inch or so of the fabric. Larger random patterns (such as florals or vines) can work since the 'jump' in the pattern at the seams is less noticeable. Solid or linen type fabrics show a crisp horizontal emphasis for a clean, structured appeal. Medium weight fabrics that fold well work best. Pedestal Bronze from Carole Fabrics - a random pattern neutral. Shade cost $329 installed. A triple washed linen by Carole - Westbury Silver. Textured solid. Shade cost $347 installed. Ellis Granite by Carole Fabrics. Nice bodied stripe to lay well. Shade price $423 installed. Mounted outside the window casing with an attached valance. The valance adds dimension off the wall, showing depth at the top. Inside mounted reverse fold in a very subtle tone-on-tone neutral stripe fabric. Solid fabrics work very well on reverse fold Roman shades.